The Killer brand of networking controllers and Wi-Fi modules have been a constant part of the computing ecosystem for over a decade. As of late, the value-add of their products has been the implementation of heuristic analysis techniques to detect data stream types (video, torrent, gaming), allowing the hardware to prioritize data streams accordingly. Last year, Rivet Networks (the company that develops and owns Killer) announced a collaboration with Intel to develop an 802.11ac Wave 2 module, built on Intel hardware, but with the Killer secret sauce. For CES this year, the company is announcing its foray into multi-gigabit Ethernet controllers. 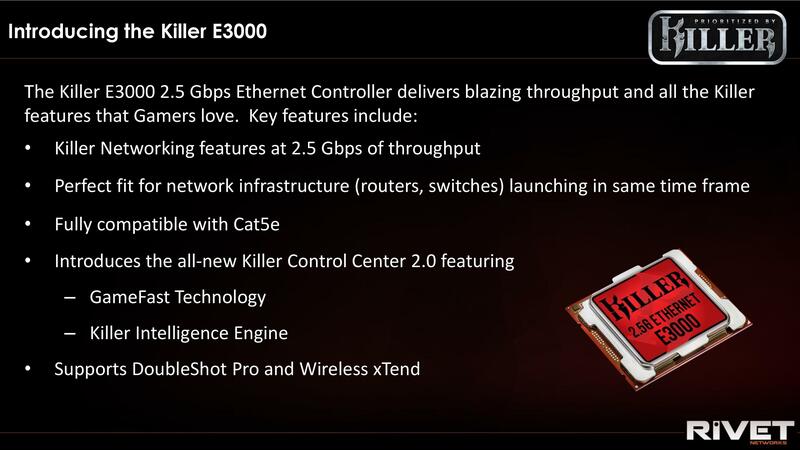 The Killer E3000 is a networking chip that supports 2.5 gigabit, 1 gigabit, and 100 megabit connectivity speeds. It will debut on a number of OEM devices during Q1, including Dell, Alienware, Acer, and also desktops and motherboards. The chip uses Killer's Advanced Stream Detect Technology that classifies data streams and prioritizes the data pipe accordingly, catching any software that is not already in a predetermined 1000 application settings list. Control over the prioritization will be done through the latest new Killer Control Center 2.0 software, allowing users to manually configure or monitor network activity. 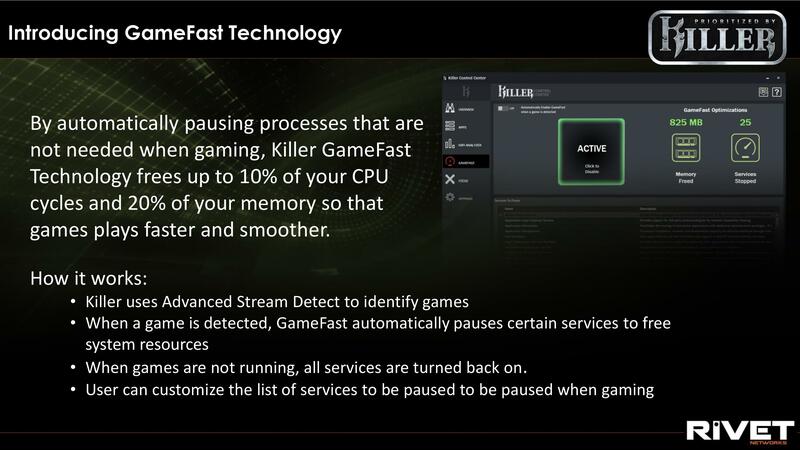 The software also comes with GameFast, which pauses known processes that steal CPU cycles (such as search indexing or background maintenance) during gameplay. Rivet reports up to 10-20% of CPU and memory can be saved depending on the system in question. The software also includes KIE, Killer's Intelligence Engine, that will offer suggestions to improve network connectivity based on the settings of the system and the quality of the connection. Obviously, the big question around 2.5 GbE networking is asking where the switches are – there's no point having 2.5 GbE if there's nothing to connect it to! Rivet Networks answered this by saying that as routers come to the market that support >1 Gbps Wi-FI speeds, such as Wi-Fi 6 (802.11ax), physical connections to these routers will also need to be upgraded to ensure consistent data-rates for all connected devices. In the press release, it was confirmed that Acer's new Predator Triton 900 and Triton 500 gaming notebooks will support the Killer E3000 controller. Other devices will be announced through 2019.